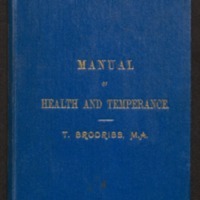 Thomas Brodribb, a former Inspector-General of Schools and Head of the Education Department of Victoria, provided the Manual of Health as an accompaniment to lessons on health and temperance prescribed by the Victorian curriculum. The book has eight chapters ‘air, food, drink, dwellings, clothing, exercise, rest and recreation and water’, with focus on the role of food being how it interacts with the body, and how this is moderated by cooking. vi, 160 pages :illustrations ;19 cm.